HOUSTON, TX – Join Houston All-Star Guard James Harden at the two-day James Harden Basketball ProCamp in partnership with Kroger presented by BBVA Compass. The camp takes place June 23rd – June 24th, 2016 at MI3 Center, 1135 Ella Crossing Dr., Houston, TX, 77090. For Boys & Girls, Grades 1 to 12. Source: Procamps. a limited edition James Harden adidas gear package, including a t-shirt, shorts, and sling bag. 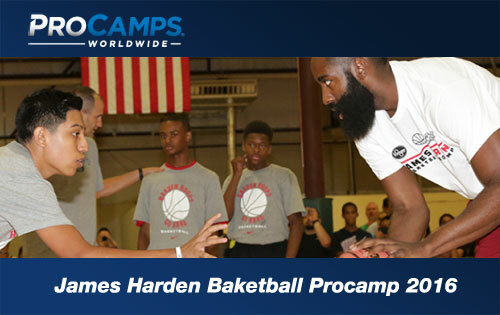 Throughout the two-day camp, James Harden and our camp coaches will offer tips and instruction. Campers will experience various stations specializing in fundamental basketball skills and will participate in games and contests. Campers will be placed in small groups by age to ensure that each child gets maximum instruction. James Harden is an NBA shooting guard who plays for the Houston Rockets. He was a first-time All-Star in 2013, his first season with the Rockets. He was named NBA Sixth Man of the Year with the Oklahoma City Thunder in 2012. Sports Speakers 360 is a booking agent for pro athletes. If you would like to book James Harden for a speaking engagement, appearance or endorsement, contact a James Harden booking agent for fees at 1.855.303.5450.